Pannus (chronic superficial keratitis) is an inflammatory disease of the dog’s cornea, or front of the eye, that worsens over time, and it usually affects both eyes at the same time. Scar tissue and blood vessels slowly invade the cornea of the eye from the corner of the eye and can turn it black in severe cases. Experts believe that it is caused by an unknown immune response that increases in severity with exposure to high levels of ultraviolet (UV) sunlight. 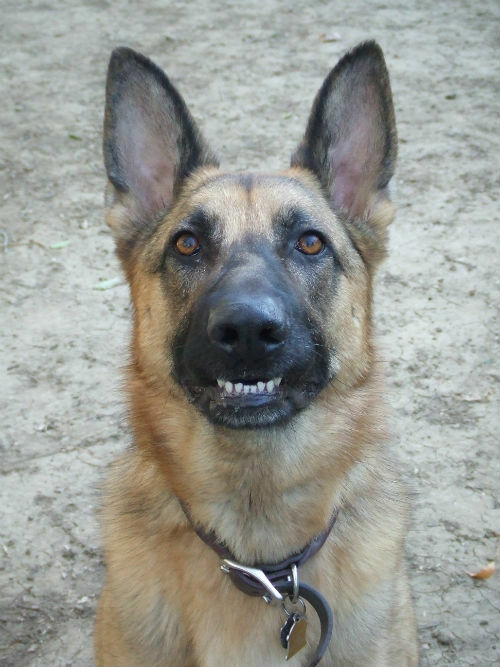 It is most often seen in middle-aged German Shepherds, Belgian Tervurens, Siberian Huskies, and Greyhounds, but it can occur in other breeds of dogs. If left untreated, this disease can eventually lead to blindness. 1. An increased occurrence in certain breeds indicates a genetic component to the disease. 3. Chronic superficial keratitis is thought to be an autoimmune disease. This means that a dog’s body response in the wrong way and attacks the tissues of the cornea as something foreign. 4. There is some evidence that irritants in the air and underlying eye problems may also contribute to this disease, such as entropion, or inward-turned eyelids. 2. Excessive tearing and weeping. 3. A grayish-pink film covering the eyes. 4. Coloring of the cornea, usually dark brown or black. 5. Opaque cloudiness of the eye. 6. Thickening and loss of color of the third eyelids. 7. Although the disease occurs in both eyes, each eye may be at a different stage of the disease. 1. Fluorescent staining of the eye (rules out corneal lacerations and ulcers). 2. A Schirmer Tear Test (measures tear production). 3. Obtain a sample the cornea and/or lining of the eye (the conjunctiva) for microscopic examination of corneal or conjunctival cells. 4. Testing of the pressure behind the eyeball [Intraocular pressure testing (IOP)]. 1. Complete blood count (CBC) to check for: anemia, inflammation, and infection. 2. Chemistry tests to check: blood sugar levels and liver, kidney, and pancreatic functions. 3. Infectious disease tests, such as those for Lyme disease, Leptospirosis, and Ehrlichiosis. Unfortunately, there is no cure for pannus at this time. If caught early, the progress of the disease can be suspended and the symptoms can be managed over the long term. However, scarring and discoloration of the cornea usually irreversible. Therapy strategies are implemented to reverse invasion of blood vessels into the corner and to prevent further scarring and pigmentation of the cornea. 1. Topical immunotherapy - Immunosuppressant drugs, such as tacrolimus or cyclosporine eye drops or eye ointment may improve symptoms. These can be used in coordination with corticosteroid therapy. In addition, immunosuppressant drugs lower a dog’s natural resistance to certain bacterial infections, so antibiotics are usually given in conjunction with immunotherapy. 2. Corticosteroid therapy - recurrent injections under the conjunctiva of the eyes in conjunction with continuous application of eye drops or eye ointments. This is the main line of defense against progression of the disease. Therapy is usually successful but must be continued lifelong. Even short periods of interrupted therapy, for example 2 to 4 weeks, may cause severe recurrence with devastating effects on the dog’s vision. 3. Surgery - In cases of severe scarring and pigmentation, surgical removal of a surface layer (superficial keratectomy) from the affected eyes may improve vision. Unfortunately, this procedure cannot be repeated and recurrence of the disease is high, so this method remains a last resort. 4. Radiation therapy - Beta irradiation is a last ditch effort to forestall the progress of the disease. This therapy is only used when medicinal and/or surgical therapies have failed. As with any medication, there are potential side effects. 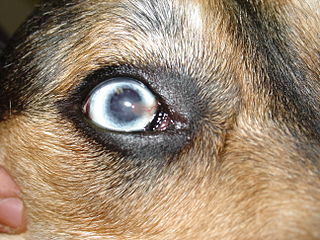 Some drug complications to be aware of are: inammation of the conjunctiva (conjunctivitis), corneal ulceration, and corneal mineralization, just to name a few.Any of these complications may result in permanent blindness , so it is important for the dog owner to be vigilant when his/her dog is undergoing medical treatments for pannus. The majority of dogs do very well with topical medications. Some dogs with more severe cases of pannus may need a referral to a licensed veterinary ophthalmologist for more intensive treatments. Because there is no cure, pannus is managed with symptom therapies. Treatment must be maintain for the life of the dog and is necessary to maintain vision. Limited exposure to ultraviolet light is also recommended for long-term control of the disease. Sheltering your dog while outdoors; walking him in the early morning hours, after dusk, or in shaded areas, and keeping him in your house and out of direct sunlight will help keep the disease in check. There are also specialty canine sun goggles that can be used if your dog has to be outdoors for an extended period of time. In addition to strict adherence to the long term therapies prescribed by your veterinarian, regular veterinary examinations and an immediate visit with the veterinarian when acute symptoms occur are all necessary to keep pannus under control and preserve your dog’s sight.